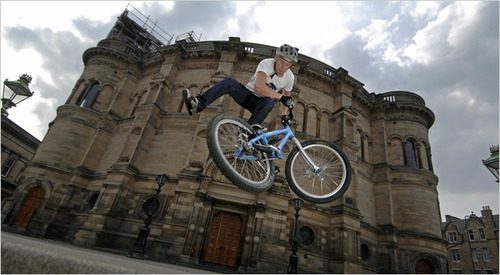 There’s a great article up on the NYTimes about Danny MacAskill‘s recent trials video gone-viral and how it’s shaped his life. Amazing how a bicycle mechanic goes from a meager salary ($9 / hour) to being flown all over the world and potentially making 6-figures. All to ride his bike. “I didn’t want to grab everything while I could and look like an idiot,” he said. Wise words. Sponsorships, money, everything comes quick to people in the lime light and how you deal with companies and opportunities will shape your future in the industry. Read the entire article for a reference to that “NYC Bike Messenger” movie.